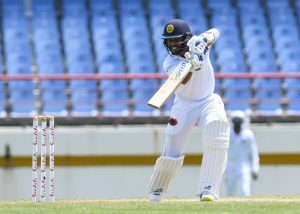 Batting: Kusal Mendis 87 off 117 balls, Dinesh Chandimal 39 off 112 balls, Roshen Silva 48 off 115 balls, Dickwella 62 off 70 balls. Bowling: Shannon Gabriel 6/57 in 19 overs, Kemar Roach 2/75 in 20 overs. 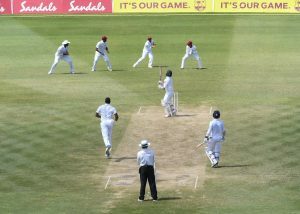 The nightwatchman Rajitha and the debutante, Udawatte came out to bat and Gabriel was given the 1st over by Jason Holder. And, WI’s strike bowler struck in his 1st over as he pinned Rajitha lbw and after a successful appeal, sent him back on a duck. De Silva joined Udawatte. 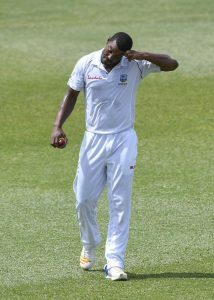 But his stay lasted only 3 overs as he gifted his wicket after chasing a wide delivery and Gabriel got his 3rd wicket. This was not the end of Sri Lanka’s troubles as 2 overs later, Roach snuffed out yet another wicket. This time it was Udawatte who got out after chipping it straight to extra cover. The Sri Lankan captain joined Mendis. West Indies kept the pressure and the two batsmen struggled for some time. But, soon they looked settled and brought their fifty run stand. At this point, Sri Lanka had extended their lead above 50 runs. Gabriel was brought back into the attack in hopes of getting a wicket. The bowler created some very good chances but couldn’t stop Mendis as he reached his fifty from sixty seven balls. One over after this milestone, lunch was called and also came the news of Sri Lanka’s captain Dinesh Chandimal being charged for ball-tampering incident. After lunch, spin was introduced into the attack in the form of Roston Chase. Chances were created by Chase but it didn’t stop Chandimal and Mendis to bring up the 1st 100-run partnership of this innings. But, 17 runs later, this match-defining partnership was broken by Roach who claimed the wicket of Sri Lanka’s captain Dinesh Chandimal. Roshen Silva joined Mendis. Both batsmen shared a extended the lead before play was stopped due to bad light. After play resumed, Gabriel struck in his 1st over to remove Mendis who fell 13 runs short of his century. Dickwella joined Roshen Silva. Both shared a nice partnership before Silva was dropped by Hope. 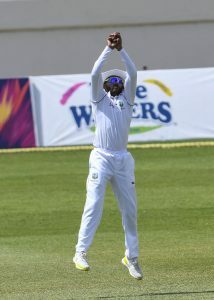 This drop catch cost West Indies as the two batsmen extended their lead above 250 and Dickwella reached his fifty in the process. 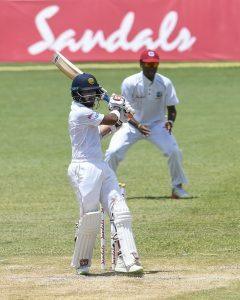 At this point, Roshen Silva was only 2 runs away from a well-deserved half-century, but he was denied of this milestone by Gabriel. The West Indian pacer claimed Silva’s wicket to complete his 10 wickets of the match and became the 1st WI bowler to do so against Sri Lanka. Dananjaya joined Dickwella. At this point, Sri Lanka were leading by 260 runs with 3 wickets in hand. Clearly, they were eyeing a total of 300-350 runs. 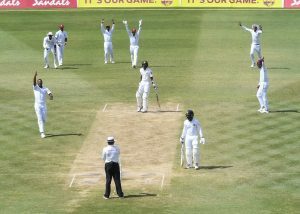 But, Gabriel returned for his next over and removed Dickwella who returned after contributing a well-made 62 off 70 balls. Dickwella departs. Good knock. May be a match winning one. Lakmal joined Dananjaya. Holder brought himself into the attack, intending to clean up the tail as soon as possible. But, the two batsmen held their ground as stumps were called. Sri Lanka ended their day on 287 runs with 2 wickets in hand. Day 5 would be very hard for WI in this West Indies Vs Sri Lanka test. Honestly Kusal Mendis impresses me every time I see him bat. This knock in the 2nd innings at St.Lucia is no different. Well played. Still a long way to go though. Join Allsportspk tomorrow for Day 5 of West Indies Vs Sri Lanka 2nd Test.